Full house at 48th Chicano Moratorium commemoration in LA | Fight Back! 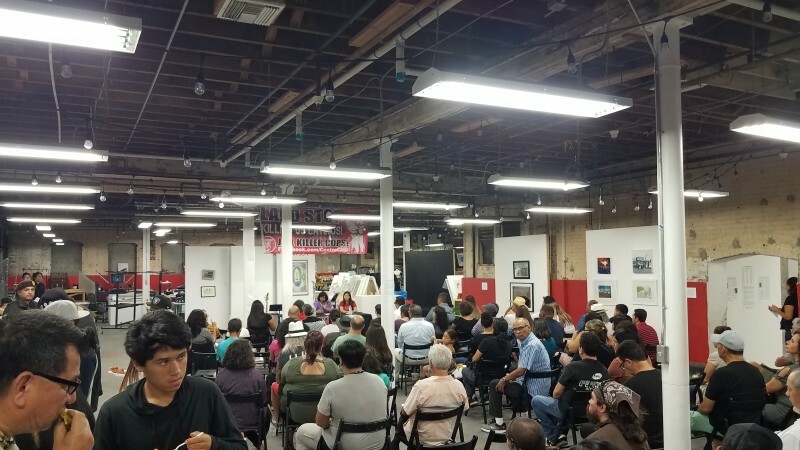 Los Angeles, CA - Families, union members, teachers, activists and students filled the house at local Chicano art center, Self Help Graphics, Aug. 29, to commemorate the 48th anniversary of the Chicano Moratorium Against the War. The program honored the historic Aug. 29, 1970 Chicano Moratorium, where over 30,000 Chicanos marched in East LA to protest the high casualty rate of Chicanos in the Vietnam War. Well-known journalist Ruben Salazar was killed by a n LA sheriff deputy during the protests. The commemoration was organized by Cento CSO, which continues to denounce President Trump's threats of interventions and war against countries like Iran, Venezuela and north Korea. CSO also calls for U.S. Navy and troops to get out of the Philippines and stands in solidarity with the people of Palestine, Puerto Rico and Venezuela. Eastside Parents Against Privatization member Eloisa Galindo spoke against the rash of charter school opening in East LA and Boyle Heights. United Teachers of LA (UTLA) leader Lupe Torres, a teacher and Centro CSO member, criticized the lack of public school funding, the high student classroom ratio and lack of support staff and unfair wages for LAUSD teachers. UTLA has just taken a strike authorization vote. Raul Ruiz, former editor and photographer for La Raza newspaper, spoke as an eyewitness to the killing of Ruben Salazar. Gloria Arellanes, a founder of the original Chicano Moratorium, Brown Berets and Las Adelitas, an anti-war woman’s group, spoke of the history of Chicanos fight against the Vietnam War and the leading role of women. The event included a talk by Cruz Becerra, a Vietnam veteran, who delivered a message of solidarity from Bayan USA; and speeches by Dalia Jaramillo, SEIU 1000 Vice President and part of the Chicano Moratorium Organizing Committee; Sol Marquez-Freedom Road Socialist Organization, and Carlos Montes of Centro CSO.